I noticed this bar when I was in the queue in WH Smiths in their offers section. I find WH Smiths to be pricey for their chocolates, but as they usually have a selection of goodies at £1 it is always worth having a look at their offers. There are often new products in that section too. I had to smile as it says something about the weather in Great Britain, that when spring beings and Cadbury’s thinks of the rain! Yes this new bar sports an umbrella on the design and is aptly named “puddles”. Mint fans will be pleased to hear that the green puddles in the bar are mint flavoured, which is a much over looked flavour in the British market. I took the wrapper off and was rather impressed by how pretty the bar within was, it had a unique design with several double puddles laid out. The bar is a little awkward when it comes to breaking and sharing, but I still managed to divi out the pieces fairly equally. 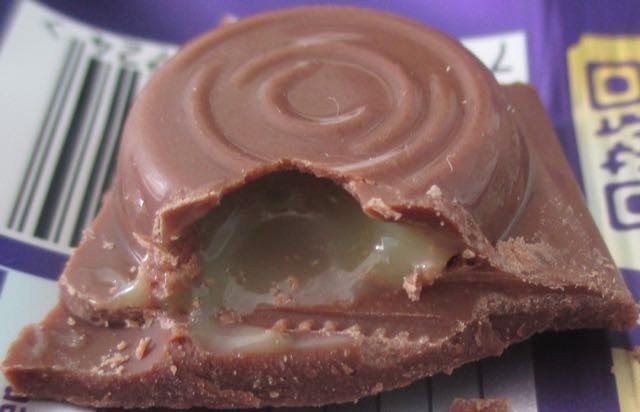 The base chocolate is Cadbury Dairy Milk, and the puddles contain a pale green minty filling. It oozes a bit, but isn’t too runny that it’ll go everywhere. It is fairly strong, but still sweet and not too overpowering. It is fresh and minty, but not as strong as After Eights. The bar is also balanced as the chocolate doesn’t have a complete filling of mint, it is just the puddles that contain it. Each puddle therefore has a thick ridge of chocolate around it, which I really liked. 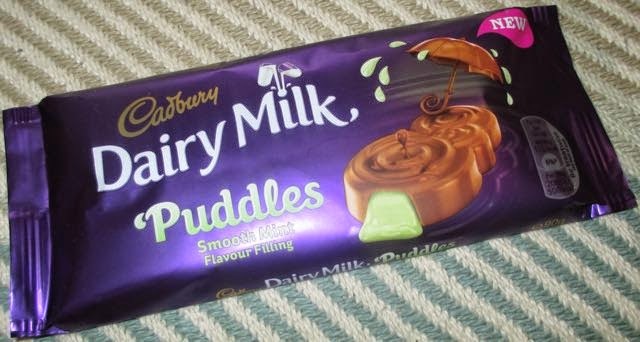 There is also a hazelnut version of this new Puddles bar available, which I’m going to have to try out next. The mint version is something a bit different, and it is nice to have a mainstream bar combining mint and chocolate. Let’s just hope the “puddles” aren’t a prediction of the weather to follow!